1,900 word ad “How to create advertising that sells” written by David Ogilvy that ran in newspapers in the 60’s and 70’s for Ogilvy & Mather. Seen by Jamie on April 19 2011. There are 16 comments. Here, with all the dogmatism of brevity, are 38 of the things we have learned. I sort of like it. I like that they are “giving away” their “secrets.” Most companies of the time would look at that as trade secrets which they would keep under lock and key. 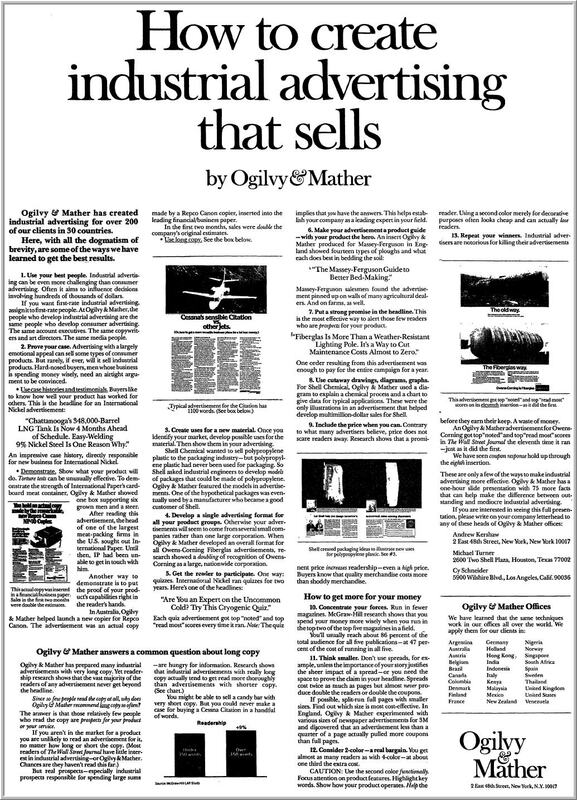 But Ogilvy & Mather understood that specific knowledge about what works was not what people paid for. People paid for those concepts to be applied to their business. This ad shows people that they really understand advertising and know solutions that drive results. But moreso, they are confident in their abilities to make it work for you, so they tell you it all up front. Research shows that long copy works. Of course Ogilvy knew this because he did his homework and performed the research. 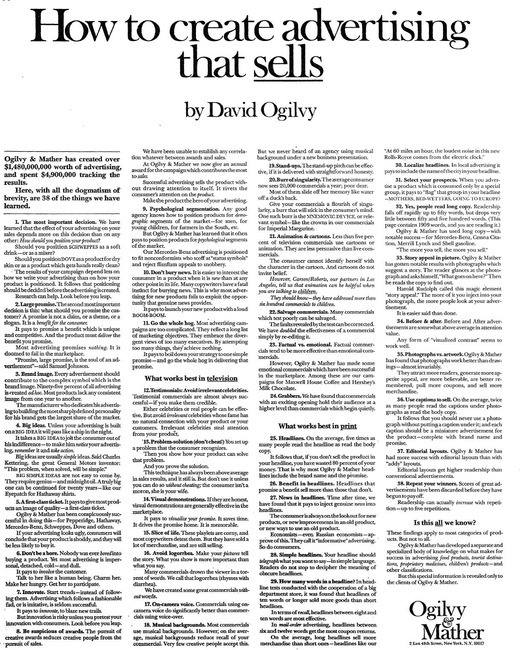 Everyone should read Ogilvy on Advertising. It’s influenced me more than any other business book I’ve ever read. 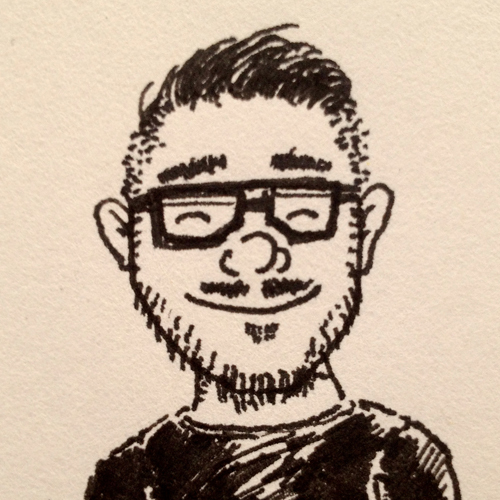 @Adam Kinda like open source code. 1. the techniques they are teaching you are even in use in their article. 2. the whole thing is even a way for Ogilvy and Mather to get more customers. the last line in the whole article is the best. if you become a customer, you get even more…. It’s probably very clever but I’m too dumb to figure out exactly why. Advertising being a men’s job, they may have thought that it should be depicted as something as exciting as getting a date? Or it might be the simple fact that it’s the housewife who buys the stuff? Does anyone have that things in a higher resolution? Want to print a poster out of it and hang it in my department. This is a great food for thought! The forefather of modern corporate blogging. Of course, this probably also led to all of those advertisements disguised as articles. Awesome. It’s almost like 37signals of advertising ;) Thanks. Do you think he fought to publish this ad? Here is the namesake with some off the wall idea to promote the business and his MBA’s and other lackeys telling him it can’t work! If blogs existed then, this would have made a great one. Very well written. Good to read it every now and then. Going to save this for future reference. Thanks for sharing Jamie – It’s good to see nothing really changes in advertising. Loved this, great info – thanks!